Instructions: Card size: 5 x 7". Cut and fold white card, cut decorative paper about 1/8" smaller than card base on all 4 sides. Cut Eyelet Lace Frame die from white, cut window (all parts) from white. Cut the center inside part of window again from decorative paper with town of Bethlehem on it. Glue Eyelet Lace Frame to decorative paper on card, use foam to pop up window, add decorative Bethlehem panel before adding decorative front of window. Glue window to card and add pearls. 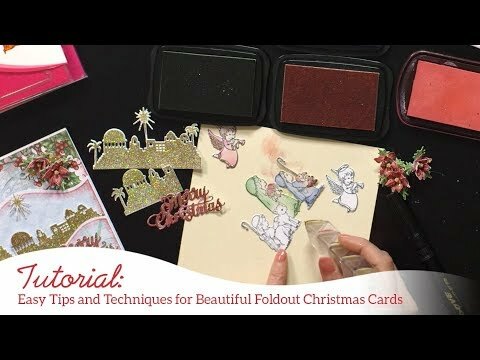 Stamp, die cut and color Holy family using black ink, Merry Christmas and several sets of Poinsettia Clusters using Warm Red ink. Sponge color on the poinsettias with Carnation Red ink and Leaf Green on holly, color the Merry Christmas image and the Holy family with Copics. Run poinsettias and holly through the die cutter machine with the shaping mold. Put 2 layers of poinsettias together to form flowers. Add non-adhesive red rhinestones to centers of 3 holly clusters and use the rest of the holly for the poinsettia bases. Add glitter to all flowers. Cut the Merry Christmas image from foam sheet, let the foam rest (over-night is best) then glue it to the Merry Christmas image to pop it up. Glue the family to the window and glue the Merry Christmas to the top of the window. Tie a triple bow with red ribbon and leave tails long. Glue the bow to the left bottom corner of the window and then curl the ribbon tails below the window and along the left side of the window. Arrange flowers along the ribbon and add extra holly leaves where needed.